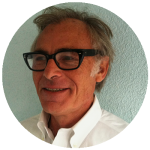 Animation du Monde / ICON Deadline Extension / First Judge & Mentor Announced! The MIFA Campus is an exciting opportunity for students and professionals from around the world to meet with recruiters, attend various master-classes and discuss initiatives and schemes in the animation industry. As a custodian of the Animation du Monde brand in Africa, the African Animation Network (AAN) are proud to be associated with an organisation that places such great importance on empowerment, a cornerstone of AAN’s mandate as a social enterprise. 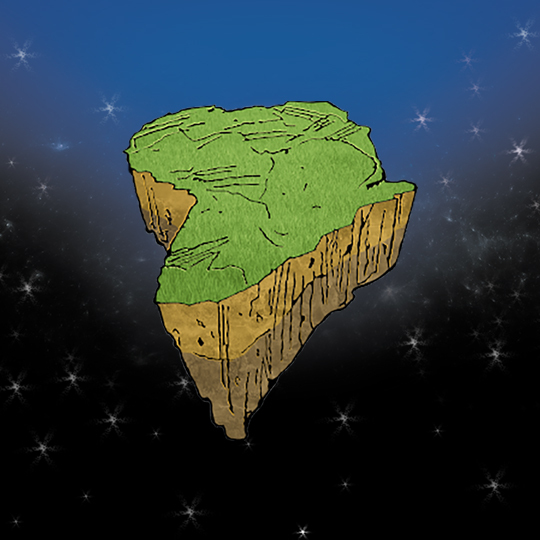 African animators are therefore invited to take part in the first preliminary round of the Pan-African Animation du Monde pitch season that will take place at ICON Comics & Games Convention (ICON CGC) from the 20th to the 22nd of April at Emperors Palace in Johannesburg, South Africa. The deadline for project registrations have been extended. Contestants have until the 18th of April (8AM CAT) to submit their project and can do so by clicking HERE. AAN have also assembled an exciting panel of international judges & mentors for this year’s Animation du Monde Continental Final that will take place at DISCOP Johannesburg in November 2019. 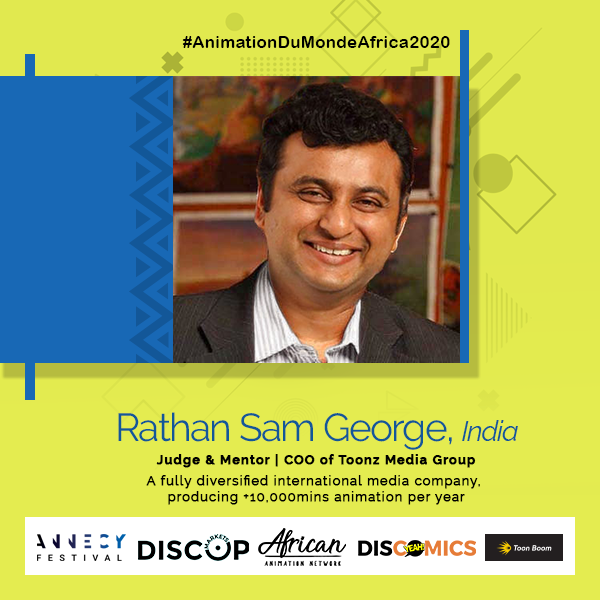 The first of the judges & mentors to be announced is Rathan Sam George (Chief Operating Officer, Toonz Media Group), who has the following to say of his involvement; “We at Toonz Media Group produce over 10,000 minutes of animation a year and have recently seen the raw potential of African creators. Partnering with AAN has created opportunities for us to share our knowledge, as well as reach out to these creatives in a way that will grow the animation industry locally. I am personally excited to find co-production and IP investment opportunities in Africa”. Animation du Monde 2020 at ICON Comics & Games Convention! 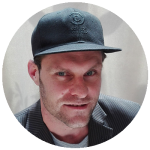 The 27th edition of ICON Comics & Games Convention (ICON CGC) is taking place from the 20th to the 22nd of April at Emperors Palace. It will host the first preliminary round of the Pan-African Animation du Monde pitch season. Contestants have until 15th of April to submit their project and can do so by clicking HERE. Video pitches will be accepted for those not able to attend the preliminary regional round at ICON CGC however, candidates who are able to attend the event will be given preference. The competition regulations can be viewed HERE. Although this is only the 3rd edition of the competition, it has already created opportunities for African producers that haven’t existed before. During the Animation du Monde 2018 finals at Annecy Int. Animated Film Fest’ & Market/MIFA, Ingrid Agbo (from Togo) secured a pre-sale for her project L’arbre à Palimpseste which is currently in pre-production. Ingrid qualified with her project through the 2017 regionals run by the African Animation Network (AAN) at DISCOP Abidjan and won one of two places to represent Africa at the Animation du Monde 2017 Continental Finals at DISCOP Johannesburg. Animation du Monde focuses on developing animation territories across the world and gives contestants the opportunity to participate at the highest level internationally during the MIFA Pitches programme. The MIFA Pitches are arguably the biggest animation focused pitching forum in the world and take place against the backdrop of the Annecy Int. Animated Film Festival/MIFA (Annecy/MIFA) in France. The Pan-African Animation du Monde preliminary pitch season also creates opportunities for creators to build relationships with other African animation filmmakers. Ingrid is using the platform that the pre-sale she won has given her, to recruit talent from across the continent to work on first season of L’arbre à Palimpseste as she builds partnerships with broadcasters from across the world. At the Continental Finals held at DISCOP Johannesburg 2018, all the finalists got to work on their projects with industry heavy hitters who were both judges and mentors. These included names like Alexis Ducord & Arthur de Pins (Co-directors of Zombillenium), Mike de Seve (Creative Director at Baboon Animation), Rathan Sam George (CCO of Toonz Media Group), and Géraldine Baché (Head of Projects at MIFA). 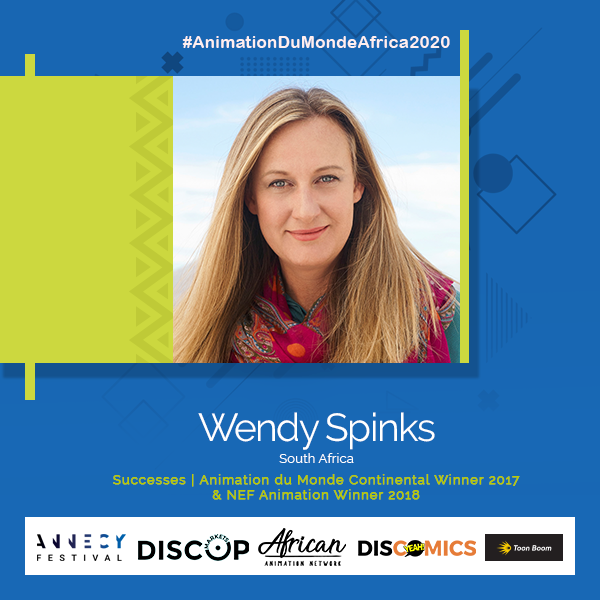 As part of the Annecy – MIFA Animation du Monde – Skills Programme, a programme of workshops, masterclasses, one-on-one project evaluations and pitch practice sessions were run at DISCOP Johannesburg ahead of the Continental Final. Participants were given valuable insights into both improving their projects and their pitching techniques. Through the DISCOMICS footprint– an initiative run by DISCOP Markets and AAN– and which includes partnerships with 3 of Africa’s longest running comic conventions, AAN will be hosting 4 regional prelims in Johannesburg (at ICON CGC), Abidjan (DISCOP Abidjan), Lagos (at Lagos Comic Con), and Nairobi (Nairobi Comic Con). Because, the partners are always looking to create new opportunities for creators across Africa, AAN has partnered with the Accra Animation Film Festival (AAFFia) to add a 5th regional prelim. Subscribe to our newsletter and keep an eye on our Facebook page and website for news on when the preliminary rounds will be in your region! If you have an animation project you have been working on that’s pitch ready, or one that’s been sitting on a hard drive somewhere, it’s time to dust it off. The Pan-African Animation du Monde 2020 preliminary pitch season is kicking into gear! As a Pan-African brand custodian of the Annecy – MIFA Pitches Animation du Monde pitching competition the African Animation Network (AAN) is launching the 3rd annual regional prelims across 5 events, starting with ICON Comics & Games Convention (ICON CGC). ICON CGC is the oldest pop culture event of its kind in Africa. Animation du Monde’s mission is to give animation projects in developing animation industries from across the world the opportunity to participate at the highest level internationally during the MIFA Pitches. The MIFA Pitches are arguably the biggest animation focused pitching forum in the world and takes place against the backdrop of the Annecy International Animated Film Festival & Market/MIFA in France. A place where animation filmmakers can celebrate the craft while building relationships and a deeper understanding of the industry. During the 2018 Animation du Monde Finals in Annecy; Ingrid Agbo, from Togo, secured an historic pre-sale for her project L’arbre à Palimpseste which is currently in pre-production. Agbo qualified with her project through the 2017 regional prelims run by AAN at DISCOP Abidjan and thereafter, won one of two places to represent Africa at the 2018 Animation du Monde Finals whilst competing at the continental finals at DISCOP Johannesburg. Through her journey she was able network with other African animation filmmakers who were able to help her refine her project through to the 2018 Animation du Monde Finals in France. Through the relationships she had built she has been able to recruit African talent from across the continent to work on the first season of L’arbre à Palimpseste as she builds partnerships with broadcasters from across the world. 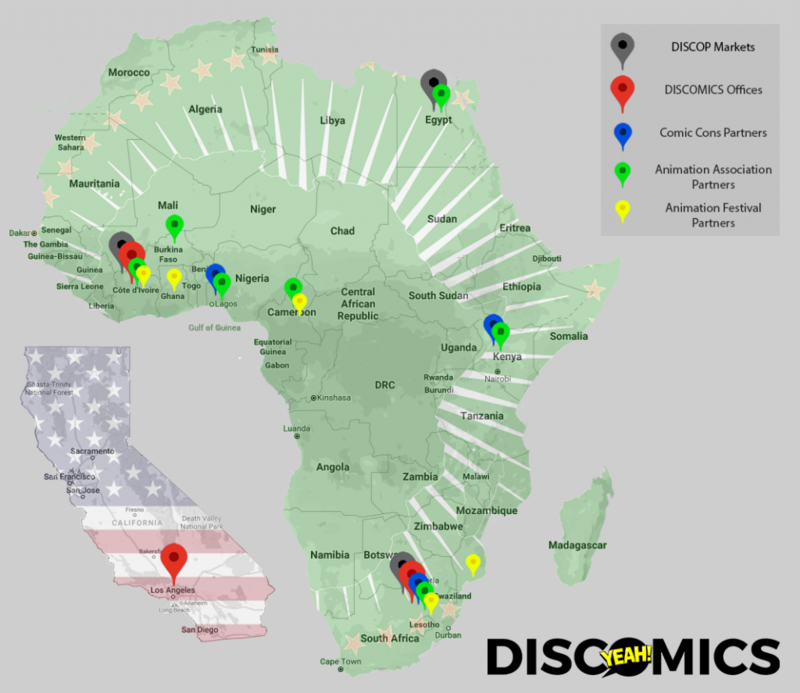 Through its DISCOMICS footprint– an initiative run by DISCOP Markets and AAN– and which includes partnerships with 3 of Africa’s longest running comic conventions, AAN will be hosting 4 regional prelims in Johannesburg (at ICON CGC), Abidjan (DISCOP Abidjan), Lagos (at Lagos Comic Con), and Nairobi (Nairobi Comic Con). Because, the partners are always looking to create new opportunities for creators across Africa, AAN has partnered with the Accra Animation Film Festival (AAFFia) to add a 5th regional prelim. 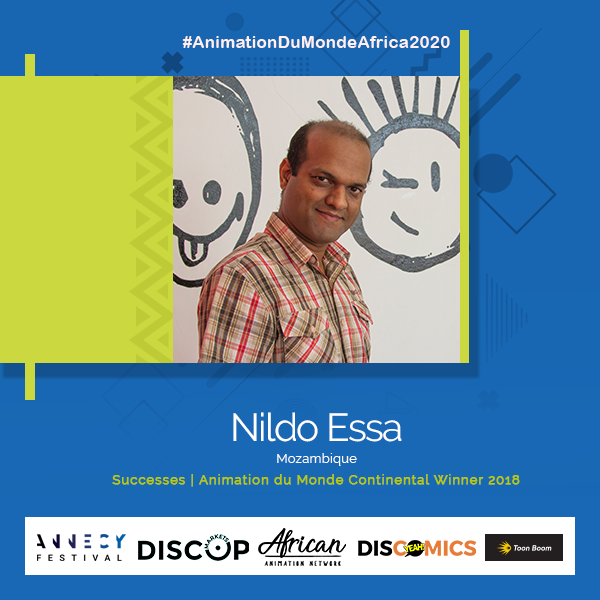 At the 2018 continental finals held at DISCOP Johannesburg, The Trouble Makers presented by Nildo Essa (of Mozambique) and The Makerbolts presented by Dami Solesi (of Nigeria) won the two places to represent Africa at the 2019 Animation du Monde Finals in Annecy. At the continental finals held at DISCOP Johannesburg, all the finalists got to work on their projects with industry heavy hitters who were both judges and mentors. These included names like Alexis Ducord & Arthur de Pins (Co-directors of Zombillenium), Mike de Seve (Creative Director at Baboon Animation), Rathan Sam George (CCO of Toonz Media Group), and Géraldine Baché (Head of Projects at MIFA). 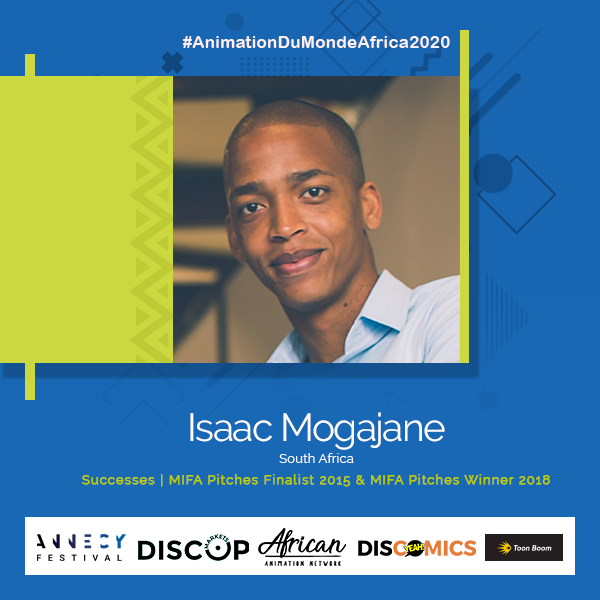 As part of the Annecy – MIFA Animation du Monde – Skills Programme, a programme of workshops, masterclasses, one-on-one project evaluations and pitch practice sessions were run at DISCOP Johannesburg ahead of the continental final. Participants were given valuable insights into both improving their projects and their pitching techniques. Nildo Essa (left of Mozambique) and Dami Solesi (right of Nigeria) will represent Africa at the Animation du Monde finals at Annecy 2019. 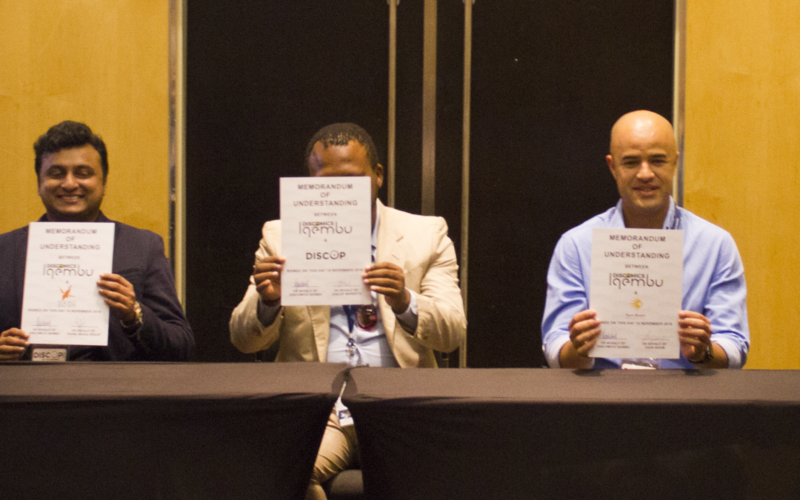 DISCOMICS founders; African Animation Network (AAN) & DISCOP Markets announced at a press conference at the recent DISCOP Joburg event, the official launch of DISCOMICS IQEMBU. AAN’s core mission is to create a sustainable African animation industry and central to achieving this goal is industry related education. Through its work across the continent over a number of years, AAN has established a Pan-African partner network of national animation associations, animation festivals and pop culture events that now includes (subsequent to an equity investment made by DISCOMICS) the 3 longest-running comic conventions in Africa; Nairobi Comic Con in Kenya, ICON Comic & Games Convention in South Africa and Lagos Comic Con in Nigeria. 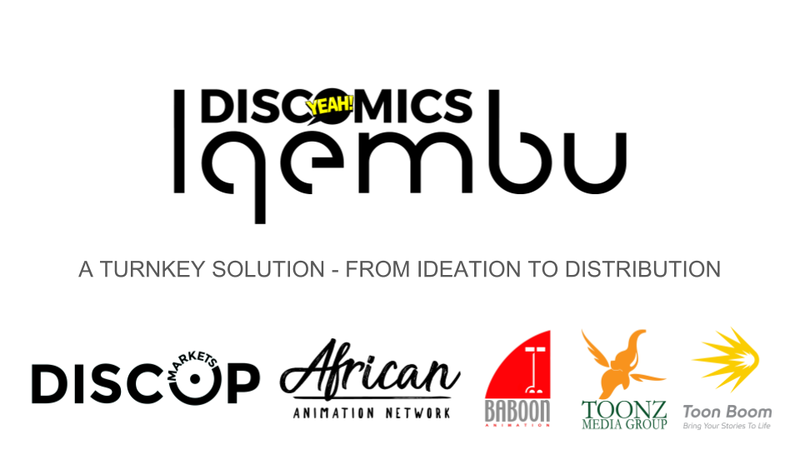 Based on this inclusive network and DISCOP’s footprint of markets across the continent, DISCOMICS IQEMBU, with the support of key international industry partners, including; Toonz Media Group, Baboon Animation and Toon Boom Animation; will drive a 3-pronged strategy forward. Based in India, Toonz Media Group is a global leader in animation production producing over 10,000 mins of animation per year. 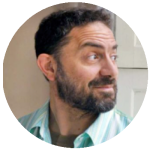 Baboon Animation, based in New York, is a world leading animation IP development team having created Emmy Award Winning and Oscar nominated writing, directing, and design for over two decades. Toon Boom Animation, based in Canada, is the leading 2D animation software service provider in the world today. AAN will co-develop animation production curricula, including a TOONZ ANIMATION FUKAMELA, and a specialised animation writing curriculum, a BABOON ANIMATION FUKAMELA. 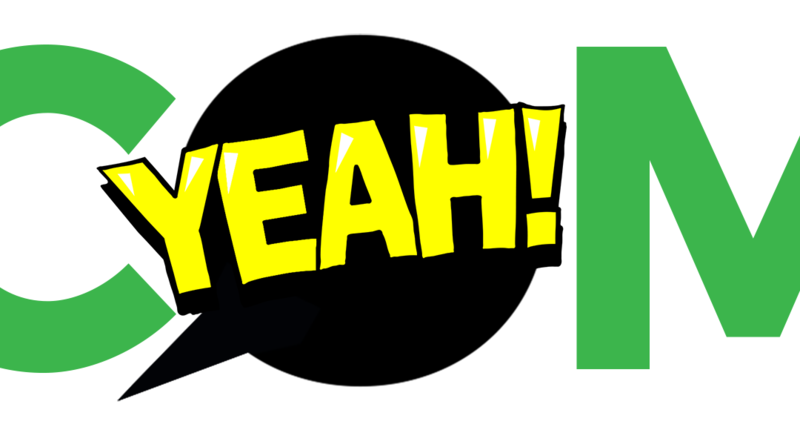 When the partners are happy with the quality of the work produced, roughly after six months, the TOONZ ANIMATION SHESHISA and BABOON ANIMATION SHESHISA will launch. 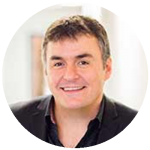 Both Toonz Media Group and Baboon Animation will supply service work to sustain the talent pool, pipeline and infrastructure. In partnership with Toon Boom Animation, AAN will co-develop a specialised 2D animation curriculum, a TOON BOOM FUKAMELA. Inclusive of the TOON BOOM FUKAMELA will be training for the creative leads/trainers. Once these creative leads have finished their training, the TOON BOOM SHESHISA will launch, an internationally accredited TOON BOOM CENTER OF EXCELLENCE. “Toonz Media Group is excited to start this journey with Africa. As the industry on the continent grows, it will become capable of sustaining itself. Education has been a cornerstone in our strategy in India to grow our own industry. 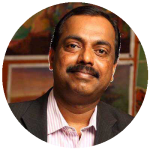 Investing into the local talent pool through developing a curriculum is just as important to developing the African animation industry.“ says P. Jayakumar, CEO of Toonz Media Group. 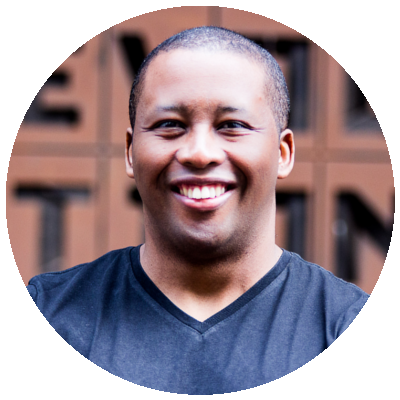 African comic book, game development and animation studios are invited to take part in the Johannesburg edition of the DISCOP content, adaptation right and project market slated from 14 to 16 November – and join the DISCOMICS Joburg umbrella. Taking advantage of Africa’s incredible reservoir of comic books, animation and video-gaming talents, the African Animation Network and the organizers of the DISCOP Markets have recently launched a new initiative, DISCOMICS, to bring these talents under the sight of international buyers and producers. Up to five programs and projects featured in the DISCOP CLUB online library for 12 months. Make a 5-minute presentation during the DISCOMICS TALENT SHOWCASE to be held in front of key players seeking fresh talent and influencing production and programming decisions. 1500+ delegates driving content acquisition, production and sales business in Sub-Saharan Africa are expected to take part in a market specifically tailored to meet the demand of a rapidly changing audiovisual landscape under the influence of a marked preference for home-grown content, the emergence of local talents, viewers’ migration to mobile screens and faster and cheaper internet. 400+ independent producers and global distributors will also attend the 3-day market with finished content, adaptation rights, works in progress and projects in development, as well as 350+ acquisition executives representing broadcasters, premium cable channels, mobile operators and streaming platforms servicing Sub-Saharan Africa. Open to up-and-coming talents from all over Africa, the DISCOMICS offer – which aims to identify, grow and support a pipeline of talented creators– is only valid until Friday 12 October. Please respond immediately to info@discop.com for further details and receive our DISCOMICS PROMO CODE and further instructions. 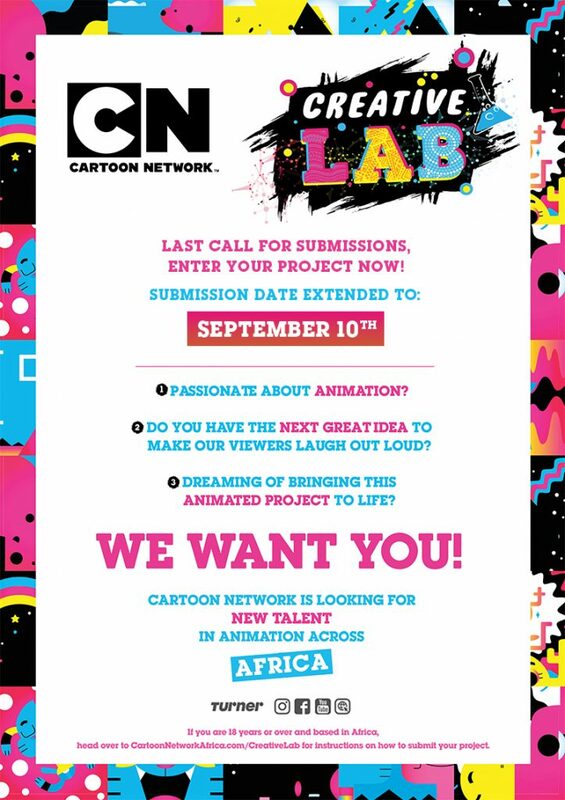 Creative Lab is looking for the next African talent in animation, don’t miss out on this amazing opportunity to submit your project and get a chance to bring it to life with one of the best international kids channels! 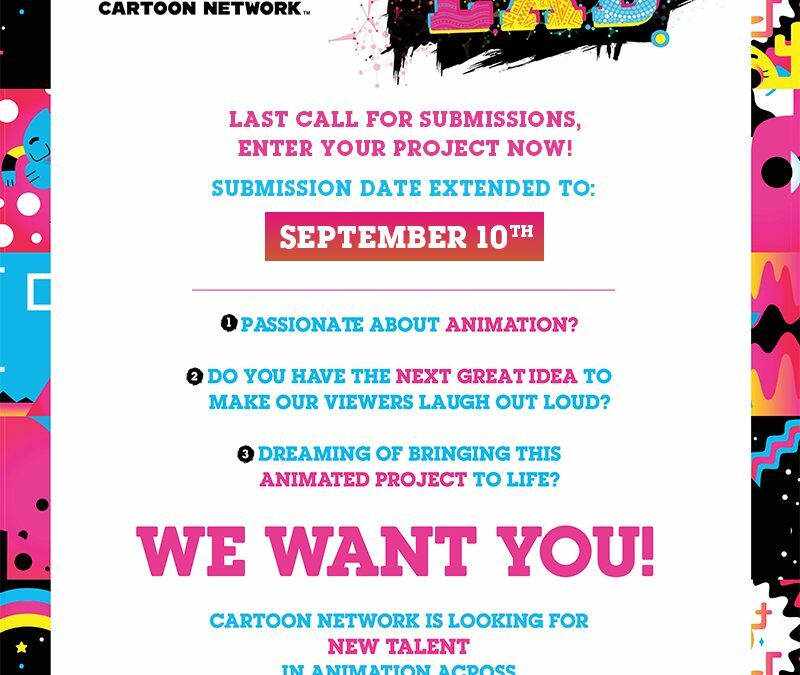 The deadline has been extended to September 10th, so take your chance and send them your amazing creative ideas!